Nickelodeon's series, which just returned for its second season, is a cartoon with commentary. Great fantasy is more than escapism—it’s believable, and ideally holds a mirror up to our world in some way. And if you’re not watching Nickelodeon, you’re missing some of the highest quality fantasy of our time, from a kids’ cartoon called The Legend of Korra. Korra is the Avatar, a distinction first described in Avatar: The Last Airbender, Korra’s also-excellent parent show that takes place in the same universe. Though many people in her world are “benders,” meaning they can control earth, fire, water or air through martial arts-style moves, only the Avatar can master all four. This simple conceit has led to one of the best and most believable integrations of magic into a fully realized, flawed world that resembles our own. When I say integration of magic—think of Harry Potter. Potter's wizarding world is deliberately separate from the Muggle world. What jobs are there, really, for a wizard, other than being a professional Quidditch player or an Auror or working for the Ministry of Magic? In the Avatar universe, people use their bending as healers, police officers, performers, soldiers and more, working in the same communities as non-benders. Harry Potter is a magical world parallel to, but separate from our own; Korra is what happens when the magical and non-magical collide. While Avatar was more traditional, a classic hero’s journey in an ancient world where kings and swords ruled, Korra uses magic as a focal point to show the growing pains of a modernizing world seeing the rise of technology and capitalism, and taking halting, jerky steps toward self-governance. The first season of Korra sees the young Avatar in the big city for the first time, where she learns that not everyone thinks bending is quite as cool as she does. A movement is growing in the cracks and crevices of Republic City, a group of people who call themselves the Equalists, who are tired of being oppressed by benders. It’s clear from the outset that the Equalists are going to be Korra’s primary rivals for the season, but the show does a commendable job of keeping things grey. Because, well, the non-benders are oppressed. Gangs of bender thugs extort shop owners for “protection,” and even when Korra runs them off, the bending battle causes serious damage to the city, which isn’t exactly grateful for her help. Professional benders are the city’s revered sports stars and the world is governed by a council of five benders. (By the second season, it’s mentioned in an aside that it now has a president, progress toward giving non-benders and benders equal voices.). But at the same time, the growth of technology is moving non-bender businessmen into positions of prominence, and creating the possibility for weapons not fueled by magic. All of which creates an environment ripe for rebellion, and rebel the Equalists do. Neither side is totally in the right—the city government engages in some serious profiling when it imposes a curfew on all non-benders (recalling a current debate over the racism of stop and frisk policies); the Equalists use terrorist tactics that are all too familiar, endangering citizens, targeting landmarks, issuing ultimatums. My only complaint about the show is that after a season spent exploring these class issues, it wrapped them up a little too tidily in the finale, when the Equalists’ Dear Leader is revealed to have been a bender all along and therefore unfit to represent the non-bending masses. But all in all, it was a pretty ambitious allegory. And the show isn’t going any smaller for its second season. The first two episodes premiered last weekend, and this time it looks like Korra and the gang will be tackling religion and spirituality. The Season Two premiere finds Korra at a state-fair-style festival of fried food and carnival games at the South Pole. Only according to her uncle, the leader of the Northern Water Tribe, the “Glacier Spirits Festival” used to be a time of fasting and solemn communing with the spirits. “Now it’s just a chance to see some rube try to stick an entire Arctic hen in his mouth,” he despairs. Step into pretty much any store around pretty much any holiday and you could complain of a similar commercialization. The Avatar isn’t just a bending master—he or she is also the bridge between the physical and spirit worlds. Where Aang, the Avatar in Avatar was more in touch with his spiritual side, Korra is a physical, athletic Avatar who has never excelled at quiet meditation. These early episodes paint a picture of “sinners in the hands of angry spirits,” as enraged ghosts smash up the South Pole. Whether they’re upset because of the festival’s secularization is unclear, though. Korra’s uncle and her father vie for her allegiance, her uncle extolling the necessity of tradition and spirituality, her father arguing that the physical and spiritual realms should stay separate. 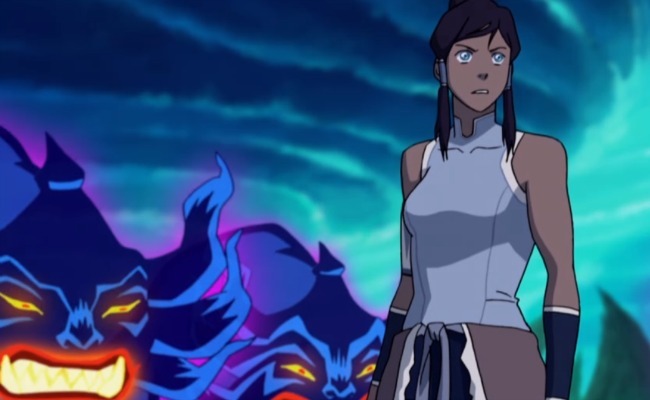 Though Korra goes with her uncle, at least for now, both sides are convincing and based on past performance, I’m hopeful that this won’t be where the debate ends, and the show will handle the issue with its usual grace. This is all Deep Stuff, but in making its nuanced social commentary, Korra sacrifices none of the warmth, whimsy, and self-referential wit that made Avatar so great to begin with. The show is never preachy, always fun, with slapstick interludes, adorable compound animals like otter penguins and polar-bear dogs, and just the right amount of romance to break up the action. All the fixings for a great kids show (though if I haven’t convinced you by now that it’s worthwhile for adults too, I never will), but what places it in the upper echelons of the fantasy genre is that its offers a fully realized, exciting world while commenting on larger, perennial questions. We’re dealing with these questions now, as we always have, and they are unlikely to have gone away by the time Korra’s core audience grows up.